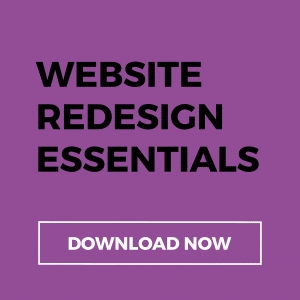 So, you’ve decided that you want to develop a new website or re-design your existing one – great! Now, where do you start? If you want to build a website that best represents your brand and engages your target market there are several factors you need to consider from the outset. Your website is your most important lead generation tool. Without a clear plan in place you risk missing the vital elements for success. You don’t want to complete your website build only to realise certain features were forgotten or pages aren’t optimised. Backtracking costs time and money, make sure to consider the following steps before you begin. What do you want to achieve by developing a new website or re-designing your current one? Do you want to increase online awareness? Do you want to boost lead generation? Or, do you want to drive revenue? Without a specific goal in mind, the task of developing an optimised website becomes hazy. It’s important that your sales, marketing and web team agree on measurable and achievable goals from the outset to ensure everyone is aligned in striving towards the same objective. 2. How will you track performance? You’ve agreed on specific goals for your website, now you need to track your progress. Setting key performance indicators (KPIs) ensures you can evaluate website performance and your marketing activities. Some key metrics might include traffic, number of leads, conversions, google rankings and blog views. Monitoring performance enables you to re-evaluate and make any changes necessary to improve. Who is your ideal buyer? Have you taken them into consideration before delving into website development? Each part of your website should be designed with your target audience in mind; their preferences, pain–points and solutions. Buyer personas are a great way to gain an in-depth understanding of your consumer’s habits, behaviours, attitudes and concerns; all of which determine how they will interact with your website. Have you yet to create personas for your business? Check out our blog explaining the importance of B2B buyer personas. 4. Will your site be easily found on search engines? You’ve designed a beautiful website, now you want to ensure search engines understand it to show to relevant searchers. Without a solid search engine optimisation (SEO) strategy even the most awesome websites will fail to rank high on Google and drive qualified traffic. In the early project stages, find a suitable domain name that visitors will type to find your business. Prior to web page build, use a keyword research tool to identify a stream of highly searched terms related to your product or service offering. By populating your pages with these terms and phrases, you will generate high quality traffic to your site. 5. Will your website content appeal to your target audience? Your website content will depend on your target audience, do they search online for solutions to their problems? If so, what content do they expect to find? Ideally, your website should act as a go-to for your prospects to find solutions to their problems and information regarding your product or service. Your buyer persona research will fuel your content creation process; focus on persona pain points and how to solve their business problems. Think of your website content as a powerful way to showcase your expertise, build authority in your sector and develop trust with potential clients. 6. Are your web pages optimised to collect leads? Each page of your website should be designed to provide visitors with the optimum experience, all the while focusing on generating leads to maximise your Return on Investment (ROI). There are 3 key elements to capture valuable visitor data; landing pages, call to actions (CTA’s) and forms. These components ensure your visitors are encouraged to click through your website and input their data in order to receive something valuable in return. E.g. eBook, Whitepaper or audit. Unlock the secret to B2B lead generation with our awesome tips. 7. How do you want people to interact with your site? A clear, well-structured website allows visitors to easily find the information and content they’re looking for. A transparent navigation system acts as a roadmap to direct visitors to various pages and information on your site. It is fundamental in encouraging visitors to stay, peruse your content and have a positive user experience, which subsequently leads to more sales and brand loyalty for your business. Focusing on your visitor’s website journey will encourage better engagement and higher conversions. Learn more about the importance of website navigation. Your website is your greatest asset. Lay the right foundations and you can easily make the necessary improvements as your business grows.